If you want to know how to get your used car dealers auction license in Florida, look no further! Your Florida used car dealers license is within your reach if you understand what the state of Florida requires. 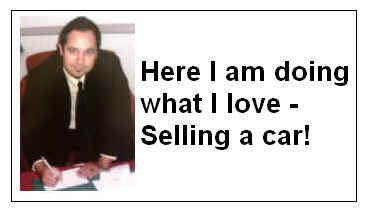 I'm James and I'm a real car dealer and have been for the past 17 years. I can help you get your Florida Car Dealer's License. A Florida Car Dealer's License is the way to go. If you want to make money buying and selling cars in Florida, or simply buy wholesale cars for your friends, family or yourself, you've come to the right place. Used cars are in high demand and Florida has more car dealer auctions than any other state! I'll show you everything you need to know, from getting your Florida dealer's license to being successful as a licensed used car dealer. I know the business from the inside-out. I'M THE REAL DEAL - IF YOU HAVE ANY DOUBT, CALL OR TEXT ME ON MY PERSONAL CELL PHONE AND I'LL ANSWER ANY QUICK QUESTIONS YOU HAVE WITH A FREE 5-MINUTE CONSULTATION. ASK FOR ME, JAMES. YOU DO NOT HAVE TO BUY ANYTHING. IN FACT, I HAVE MUCH MORE FREE INFORMATION ON MY MAIN SITE: www.dealerlicense.com - Just click on "Free 12 E-Book Study Course". After you get your Florida Car Dealer's License, WHO will teach you the business? There are many programs online where you can "rent" a dealer license or get licensed out-of-state. If you are wholesaling from auction-to-auction, it's difficult for your state to bust you. However, these programs can be problematic, especially if you are advertising to the retail public in your state, even if you are a wholesaler who sells "through" a network of local dealers. Even if you have a wholesale license in another state, by advertising to the retail public in your state, you are purporting to be a retailer and since you do NOT have a retail license in your state, the state considers it "unlicensed auto sales", which is usually a misdemeanor crime. If you don't believe me, simply call your local DMV investigator and they will certainly tell you the same thing. Florida DMV Investigations is Cracking Down on Out-of-State Car Dealer Licenses! Recently someone called me about advice because they were busted in their state for unlicensed auto sales. What happened was they lived in Florida and had a dealer license based in another state. They advertised a car on Craigslist.com and an undercover DMV investigator pretended to be a customer. Even though he had a dealer license in another state, when the Investigator found out that the dealer did NOT have a Florida dealer license, the DMV slammed the guy with a civil injunction lawsuit against him and if he continues to sell cars in Florida with an out-of-state license, he will be prosecuted as well. That unlicensed dealer has had to pay thousands in attorney fees for his defense. The investigator was nice enough to give him a "slap on the wrist" with a civil suit only, but not all investigators are that nice - you can be prosecuted. Do you want to take that chance? Why pay monthly fees to an out-of-state company when the same monthly fees can be applied towards your OWN in-state car dealer license. I talk to dealers all day and many tell me that it ended up being CHEAPER getting licensed in their own state. If you know what the MINIMUM requirements are, it can be done. Your state will tell you the requirements, but they will NOT tell you the easiest, fastest and cheapest way to get your Car Dealer's license. You can learn the easy, fast and cheap way here. "OUT OF STATE DEALERS: If you purchase a vehicle, it MUST be exported outside of this state." Not all auctions have this policy, but the trend is for more and more auctions to follow this rule. The auction does this per the state's request because the state knows most out of state dealers who buy, will try to sell that car in the state the car was purchased in. This is a back-door method that the state is using to further crack down on unlicensed auto dealers. What this means is that the dealer auction will NOT release the car to you because you have an out of state license - you need to show the auction a bill of lading from a trucking company that says the car is going to be transported out of state. This can be MAJOR problem if you have an out of state license! Do it the right way - get a dealer license in your OWN state in your OWN name. When I got my license I realized it takes a little patience, but it is NOT difficult if you are aware of what to expect and what the minimum requirements are . In fact, the vast majority of licensed dealers don't have huge lots and fancy signs - they do the minimum required to get licensed. The minimum requirements can be quite simple. I WILL SHOW YOU EXACTLY HOW TO MEET MINIMUM STATE-LICENSING REQUIREMENTS! Do you really need my help for your Florida Car Auction License? How can my program help you? I'm sometimes asked, can't I get the requirements online? How can your program help me? 2. The state will NOT hold your hand and guide you through the process step-by-step - That's my job! 3. The state will NOT show you the easiest and cheapest way to get licensed - Again, that's my job! 4. The state will NOT show you how to succeed and make money in the car business - My job again! 5. The state will NOT take your emails and phone calls if you need help along the way and after you get licensed - I will! WILL THIS Florida Car Dealer's License Program WORK IN ALL STATES? Requirements do vary slightly from state to state, but most states have certain requirements in common with each other. For example, most states require a bond, but vary in the amount of the bond. One of the books available, called "Secrets of Licensed Car Dealers" contains the requirements of all 50 states in the appendix! In my "Dealer License" manual, I discuss the easiest and cheapest ways to acquire the bond. The materials we provide will help you get a dealer's license in all the following states: Alabama Alaska Arizona Arkansas California Colorado Connecticut Delaware Florida Georgia Hawaii Idaho Illinois. Indiana Iowa Kansas Kentucky Louisiana Maine Maryland Massachusetts Michigan Minnesota Mississippi Missouri Montana Nebraska Nevada New Hampshire New Jersey New. Mexico New York North Carolina North Dakota Ohio Oklahoma Oregon Pennsylvania Rhode. Island South Carolina South Dakota Tennessee Texas Utah Vermont Virginia Washington West Virginia Wisconsin Wyoming.